This is the second Tandem Wing Fly-in I have actually flown to. I just love these grass roots events. Sam Hoskins put together two seminars that were outstanding, thanks in part to Charley Rodriguez, who is an instructor at Southern Illinois University based right there at Carbondale. What a great facility! What a great place to have a fly-in. Here are a few comments from those that attended. I flew down on Friday afternoon at which time I was the third Q to arrive. Flying down took 1.7 hrs at just under 120 mph ground speed. (Going back took 2.2 hrs at around 95 mph.) Despite the overcast, it was good flying. Terry Crouch and Doug Humble had already arrived. Joseph Snow brought his Q, still under construction, down from the Cleveland area on a trailer. Other arrivals were Jerry & Nancy Marstall, Dave & Suzie Richardson, Ron Trianno, and a few who I didn't know. Of course Sam had his Q200 on display sporting redesigned wheel pants. Sam's new wheel pants look pretty good. One is an off red and the other is an off green. CUTE!! Reck'n he does plan to paint 'em. Sam had made arrangements to have supper Friday evening at the old train depot in Murphysboro, which was GREAT. 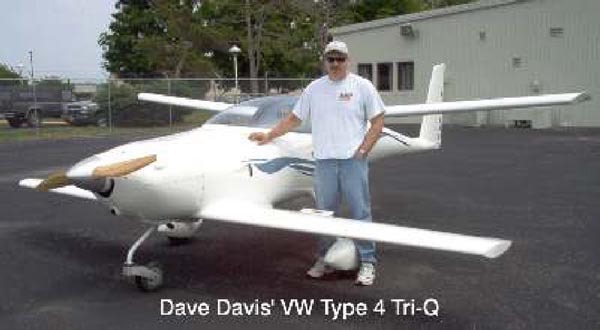 Saturday brought Dave Davis, who had just flown off the time on his VW Type 4 Tri-Q, Lynn French, Jeff LeTempt, Steve Larribee, a KR-2 and a Cessna 170. I counted 9 composite's on the flight line. The carburetor and magneto classes were surprisingly good. 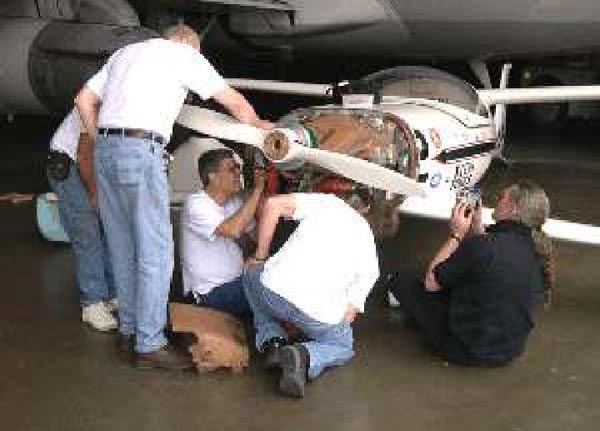 I learned a lot, as my C-170 has the same carb that was featured in the seminar. 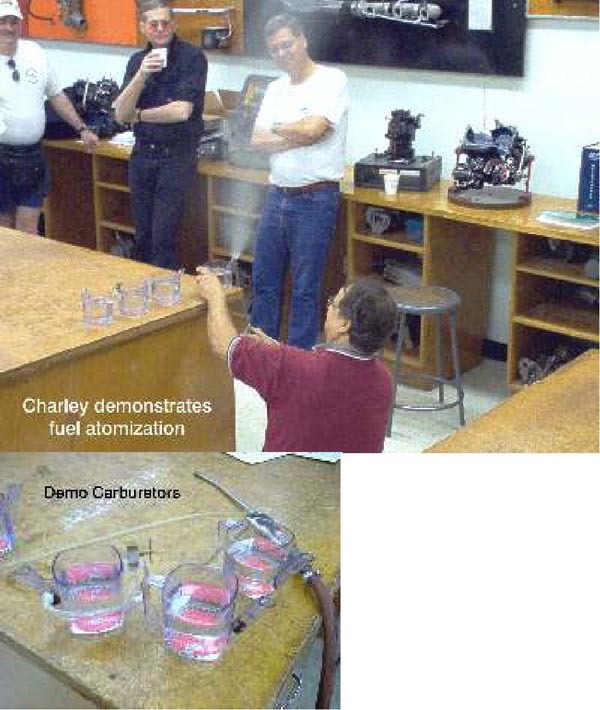 Charley Rodriguez introduced us to the fundamentals of carburetion and how they work. He went from the basics to the actual carb and answered many questions. GREAT STUFF!! 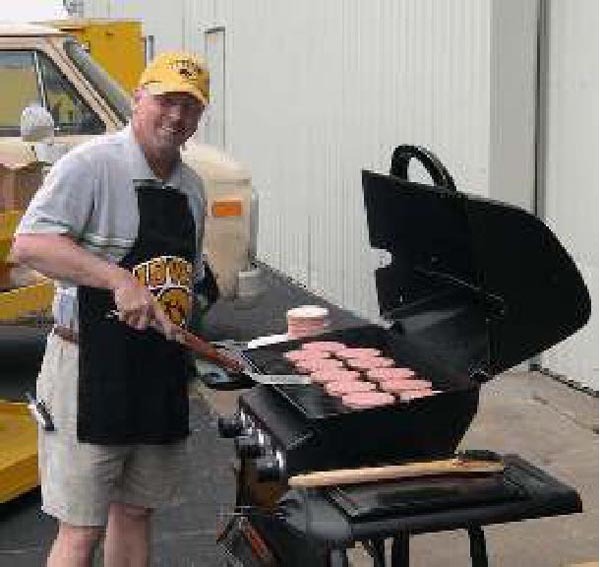 Doug Humble, Hawkeye apron and all, grilled hamburgers for Saturday's lunch. Thanks to Sam's generosity, the meal came complete with all the sides. The donation cup filled up fast. Good to know people care and appreciate. 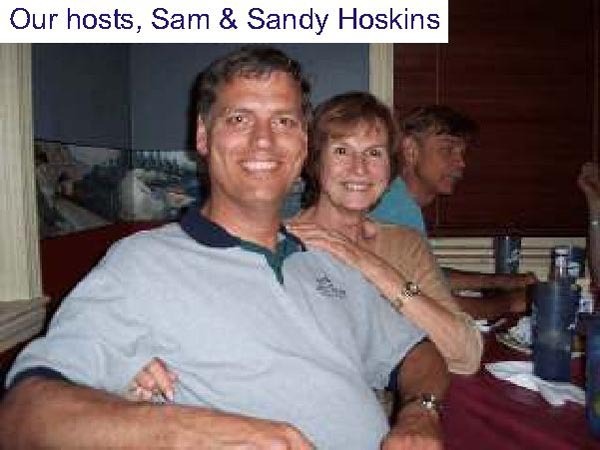 Susie and I want to add our thanks to Sam and Sandy for hosting this growing event. Your time, efforts and hospitality are truly appreciated. Charlie Rodriguez did a fabulous job demystifying and bringing the Marvel-Schebler model MA 4SPA carb alive with his demonstrations. Amazingly the concepts he presented directly translate to the RevFlow carb I'm using and makes the innards much more understandable. I'm figuring Larry Koutz should just about have his gravy strainer carb done by now and start testing it on his Corvair soon. I'll leave the details for Doug to describe in the newsletter, but suffice it to say that if you missed this one, you missed an excellent forum. Charlie is a TRUE educator! Sam, Sandy, Charlie, Doug, and all who attended, I really want to thank you for a great time, It was nice to see faces I haven't seen for a few years. Sam, the large hanger was great, as was the tour of the facilities. Made me want to enroll back in college again. Also, the choice of restaurants was top notch. I took plenty of pictures to help me on mounting all the hardware firewall forward. This really was a great event for those of us still trying to complete our projects. I arrived back in Cleveland at 2:00 pm on Monday. I stopped in Dayton overnight at a friend's house on Sunday evening. The Spring Fling was a great experience for me. I had the benefit of having builders of flying Q's look at my bird (on the trailer) and offer lots of straight comments. I have written down everything I could remember. I had the opportunity to look at some beautiful Q's to see how other builders had done things. And, I had my very first ride in a Q. WOW! 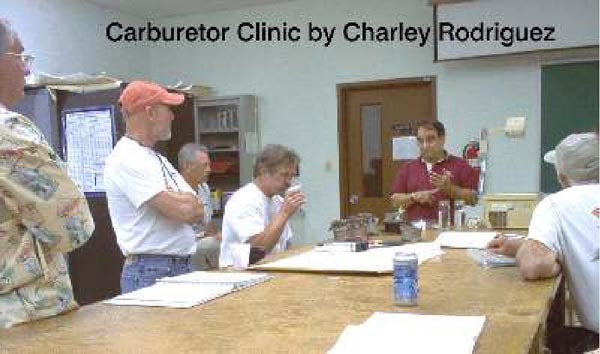 Charlie of SIU provided great seminars regarding the Marvel-Shebler & Slick magnetos. I have a MS3-SPA and I rebuilt it. But I still did not know how it worked. I had heard of the air bleed, but I did not know this gizmo helps to atomize the fuel. Charlie also patiently answered all of the questions I kept asking. Thanks Charlie. And I got a ride. (Did I mention that already?) Awesome!!! I got my hands on the stick. The Q-200 is stable, easy to control, with great visibility. Then, there was the opportunity to talk about Q's. Just to talk to someone who really knows a Q after spending all this time alone in a garage building on a Q. Outstanding experience! 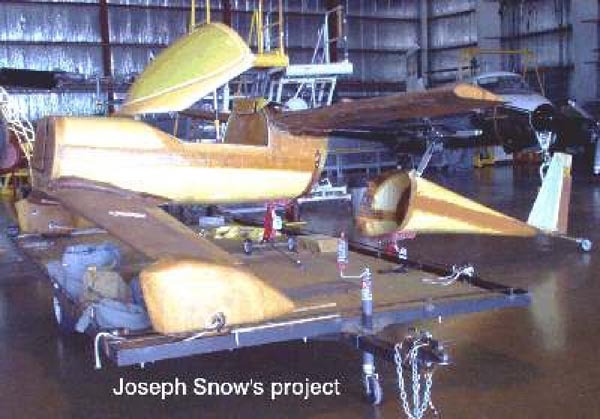 1 40% complete Q-2 (Corvair) on a trailer; Joseph Snow. In addition to the fly-ins we had drive-ins from North Carolina, Ohio, Arkansas, Indiana, Missouri, Georgia and other places. We even had two folks, Damien Gregory and Ron Triano, come all the way from L.A. and Lake Tahoe! It was great seeing our not-so-old friends, the Marstall's, the Richardson's, Elephant Ear Larry, Bob M. and everyone else. I especially want to thank my wife, Sandy, for helping to organize the event and putting up with me. Thanks to the SIU Aviation Technologies Department for use of the facilities and to Charley for his fine seminars and for keeping us entertained. Doug, great work on the grill! It was just great - See you at Oshkosh and at Sullivan! As I said in the opening, this was my second cross country trip to a Q fly-in. It should have been a trip taking less than 3 hours with no stops, but weather made me divert to the south a bit where I stopped to check weather and pick up fuel. The last 50 miles was a bit uneasy as I had to fly at 1800 feet in less than ideal visibility. The trip home was made more comfortable by flying with Lynn French. Having someone to help with the decision making process means everything. We flew between layers for about the first hour before we broke out into severe sunshine. We also fought a strong headwind all the way home. At one point after we went our separate ways, I saw a ground speed as low as 100 mph. I calculated my gas mileage to be under 4.5 gph. I just love this part of my Q. I'll never go the speed the O200 would provide, but I love that gas mileage! One of the highlights for me was to visit with Dave Davis about his VW type 4 powered Tri-Q. This was the first time we got to compare notes on our engines. 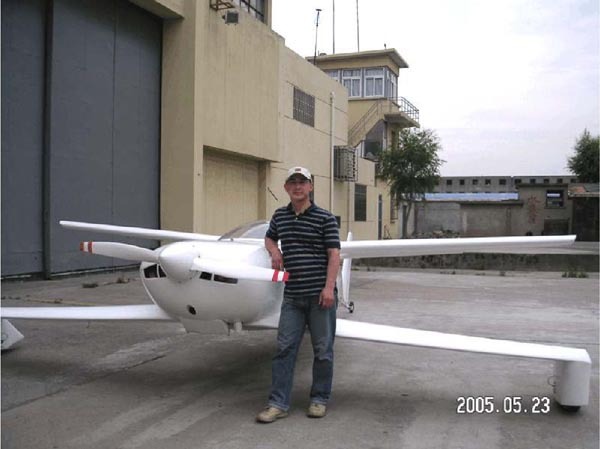 The Quickie appeal is global!A RevMaster powered Q2 built by Lany Wang of Shanghia China. Lany will be atOshkosh this year and is looking forward to talking to other Quickie builders. You can order a printed copy of Q-talk #111 by using the Q-talk Back Issue Order Page.